The robotic fish can swim for an hour on a full battery charge, and it relies on a ballast system similar to those used in submarines to adjust its buoyancy and depth. Tai-robot-kun's creator, professor Ikuo Yamamoto, says the robot can easily be mass-produced, outfitted with various cameras and sensors, and released into the sea to perform a wide range of oceanographic survey tasks. He adds that because the robot swims silently and looks like a real fish, it would be able to gather data without alarming the creatures it encounters. Yamamoto and his team are also reportedly developing a robotic manta ray that uses some of the same technology. 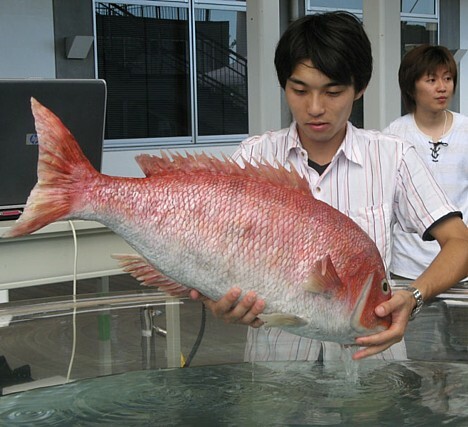 It'll be interesting when the fishermen start accidently catching and then selling robot fish in Tsukiji. Love the site! How about a link exchange? I've linked you already. Does anyone know anything about the music in the video? The fish is cool and lifelike, for sure. But the fellow in the picture - is that Prof. Yamamoto? - is handsome as can be! » A Fish that is not a Fish - Video Within TechieLobang - News, Tips & Tricks: Get updated on Technology plus all other Interesting Things!